Posting detailed shipped orders to QuickBooks will create an individual invoice for each order. If you only want to post order totals for profit and loss, use the Post General Journal Entries feature. It is recommended to reconcile payments from the SellerCloud interim account to your actual bank account into which payments are entered. Open QuickBooks on the same computer as QuickBridge. In QuickBridge, click QuickBooks > Post Detailed Shipped Orders. Choose the appropriate dates and other filters. Note: The Channel filter only offers choices when orders from that channel exist in your date range. Click Get Shipped Orders. The grid will populate with orders that have not yet exported to QuickBooks. Click Post Invoices to QuickBooks and await the pop-up confirmation. In QuickBridge - Orders will be removed from the grid. 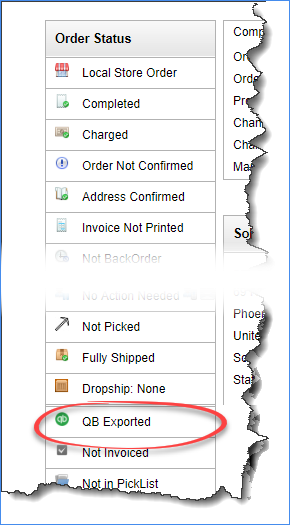 In SellerCloud - Order Status will show as QB Exported. Show me where. Need to edit an exported order? Simply mark it as Unexported so you can update it. Customers - New accounts are created for each new customer and returning customers have orders placed in their existing accounts. Channel orders can be set to a generic customer (QuickBooks > File > Options > Main tab > Use Generic Customer Name box); otherwise, customer name in QuickBooks is populated with the order number. Payments - All orders are considered paid so they are not entered into Account Receivable. Instead, channel orders are placed into interim accounts created by QuickBridge (Amazon Interim Account, eBay Interim Account, etc.) with a paid status. The balance in these accounts can be transferred manually into a bank account. Products - All new products are entered into Items and Services with the adjusted value on hand. If a new item is created, the inventory on hand will show negative quantity. Shipping costs and commission fees - These costs are exported to Accounts Payable as bills to a vendor, like the various carriers and channels (vendor accounts are created as orders are imported. e.g. PayPal Fees, Commission Fee). By default, orders in foreign currency will post to QuickBooks in USD using the conversion rate saved on the order. As of Version 1.0.9.8, you can post orders in the foreign currency using QuickBooks' multi-currency feature. To enable, go to QuickBooks > File > Options > QuickBooks Features > check Use Multi-Currency Feature in QuickBooks. Only use this option if the Multi-Currency feature is enabled in QuickBooks. 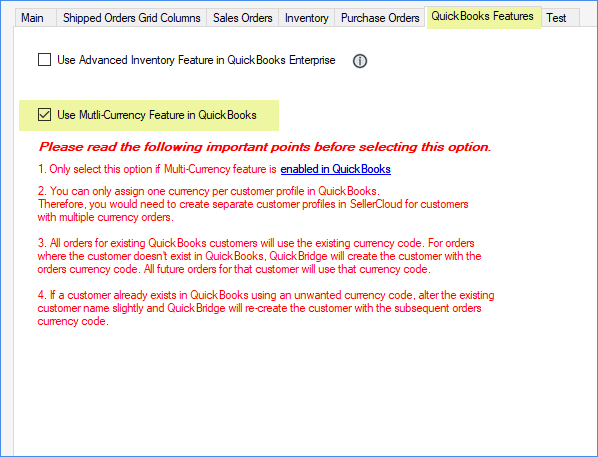 All orders for existing QuickBooks customers will use the existing currency code. For orders where the customer doesn't exist in QuickBooks, QuickBridge will create the customer with the orders currency code. All future orders for that customer will use that currency code. If a customer already exists in QuickBooks using an unwanted currency code, alter the existing customer name slightly and QuickBridge will re-create the customer with the subsequent orders currency code. Using this feature requires selecting the Enable QuickBooks WorkFlow setting in the company's Client Settings. Enter the order in the Order # field > Search. Select the order > click Action Menu > Mark QB UnExported > Go. Edit the order as needed.